Anyone paying attention, knows that last night was a huge win nationally for the Democrats. Especially in Governors races, where A Democrat won in both North Carolina and New Jersey handily. It is also a widely held belief across party aisles and pundits that the Democrats had a great night mostly as an American public repudiation of The Donald! Democrats scored a pair of major gubernatorial victories Tuesday, based on ABC News' analyses of the exit poll and vote, landing new governors in New Jersey and Virginia as the party attempted to showcase resilience one year after President Donald Trump's surprise election victory. In Virginia, which was expected to be the closer of the two races, Democratic Lt. Gov. Ralph Northam prevailed over former Republican National Committee chairman Ed Gillespie, based on ABC News' analysis of the vote, while in New Jersey, former U.S. Ambassador to Germany Phil Murphy beat Republican Lt. Gov. Kim Guadagno, based on ABC News' analysis of the exit poll. The Virginia race, in particular, took on the air of a referendum on Trump throughout the campaign. The commonwealth's status as a swing state in presidential years and the stark divide between its suburban northern region and rural Appalachian southwest turned it into a representative test case on the country's response to the two major political parties a year after electing the former real estate mogul. 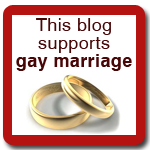 Although I think that Scott Walker, as head of the Republican Governors Association(RGA), is in line for a good chunk of the blame also, but that is another post! 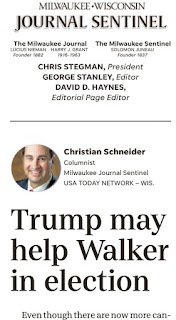 Speaking of incompetence in Wisconsin, one of the great mysteries is how in the world can Christian Schneider have his own column in an organization that is in trouble financially and wants to be considered credible? In a surprise to no one, here is Schneider's column the morning after the shellacking! 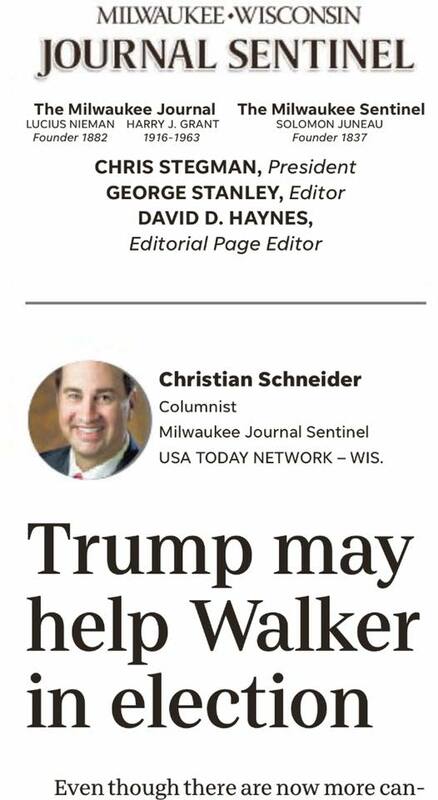 Ultimately, though, the Trump Effect in Wisconsin likely will help Walker. After all, Wisconsin voters knew full well who Trump was when they went to the polls, and they voted for him anyway. If there’s evidence that associating with Trump hurts Republican politicians in the state, I haven't seen it. In the upcoming months, you may be hearing pundits wonder how Scott Walker can overcome the Trump Effect in Wisconsin. Actually, they should be asking Democrats that question. Schneider is trying to desperately to spin the Donald GOP marriage mess that he is obviously dizzy! And THAT is why I won't give the Journal-Sentinel a dime until they fire that Bradley Foundation hack. Watch people start heading to the exits in the next few weeks. 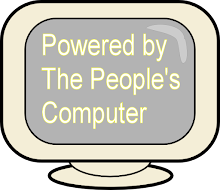 Walker's already running away from Foxconn, and there will be plenty more he and Schneider will try to spin away from after that. POUND THEM.